This is a review for Raw by Rae desserts. I was sent a free sample in the mail and asked to give an honest review. I am not receiving any money or compensation if you purchase these desserts. Have you heard of Raw by Rae? If you haven’t, you’re not alone. I hadn’t heard of it either. I was approached to do review on these desserts that were all-natural, vegan, and gluten free. I replied that I would be happy to give an honest review. So, I was sent a free sample of some of the flavors in the mail. The samples arrived a few days later. I couldn’t wait to open the box up and give them a try them! I was sent four samples: Cinnamon Roll, Original Brownie, Lemon Coconut, and Salty Caramel. The first sample I saw was Cinnamon Roll. I haven’t had a Cinnamon Roll in so long, I quickly opened up the plastic case and took a little bite of the round balls that were sitting there. I don’t know what I was expecting, but it didn’t taste like a cinnamon roll. I looked again at the package, and noticed that these had to be refrigerated. So, I put it away to try again for another day. I also took another look at the ingredients. The first ingredient was dates. Now, I’ve never had dates – or at least not enough to know what they taste like. Maybe that was why these tasted so different. They were good, but different. After a few days, I pulled the samples out and tried them all again. When I took the bite of the cinnamon roll, I still didn’t think it tasted like a cinnamon roll – at least the ones I was used to. In all fairness, I don’t think I’ve had a cinnamon roll in almost two years, and the ones that I had – or might have tasted – were slathered in icing. After finishing this flavor, I could definitely taste the cinnamon and the sweetness a little more. I could say it tasted like a cinnamon roll – but without the icing! I also decided to sample the Original Brownie flavor the day I received these samples. After all, brownies are one of the desserts I still eat!. These dessert balls smelled like chocolate and were moist like a brownie. I took a bite. I could taste the chocolate, but I couldn’t really taste the brownie. I don’t know if it was the taste of the dates, or what, but I couldn’t taste the brownie that much. You do need to remember that I’ve been making black bean brownies for the past year, but even those have tons of chocolate chips in them. I had the taste of these brownies in my mind when I took my first few bites. When I sampled this flavor again a few days later, I had the same reaction. These were good, but they were not my favorite. My kids really, however, really enjoyed this flavor! I waited on this flavor until the desserts had been in the fridge a few days. Have you seen Willy Wonka and the Chocolate Factory, or read the book it’s based on? If you have, you are probably familiar with the 3-course meal gum that Wonka works on. As I bit into this flavor, I felt like i was eating a 3 course dessert ball, being able to taste almost every ingredient by itself. My taste buds went everywhere. I could taste the lemon, then the coconut, then the dates, then the lemon, etc. As I sat there enjoying this flavor, it was driving me nuts trying to figure out where I had tasted a lemon flavor like this. It wasn’t sour like lemon juice, or ultra sweet like a lemon drop. Finally, it hit me! Eating these almost tasted like eating a lemon muffin. These were delicious! The last sample I tried was Salty Caramel. Now, I’m not a big fan of salt, and would take chocolate over caramel almost any day. So imagine my surprise that this flavor became my favorite! It was moist and tasted like caramel – even though there is no caramel in it! I’m not sure what it was – maybe it was the different extracts, or the fact that it was made using sea salt. Whatever it was, the ingredients blended together in a perfect concoction that I hid in the back of the fridge so that I could have them all to myself! The overall impression of these desserts: they were good! The taste of dates took some getting used to, but the more I tried them, the more I liked them. Something else I like about these are the ingredients! They are made with all natural ingredients, including all natural sweeteners such as maple syrup or vanilla extract. 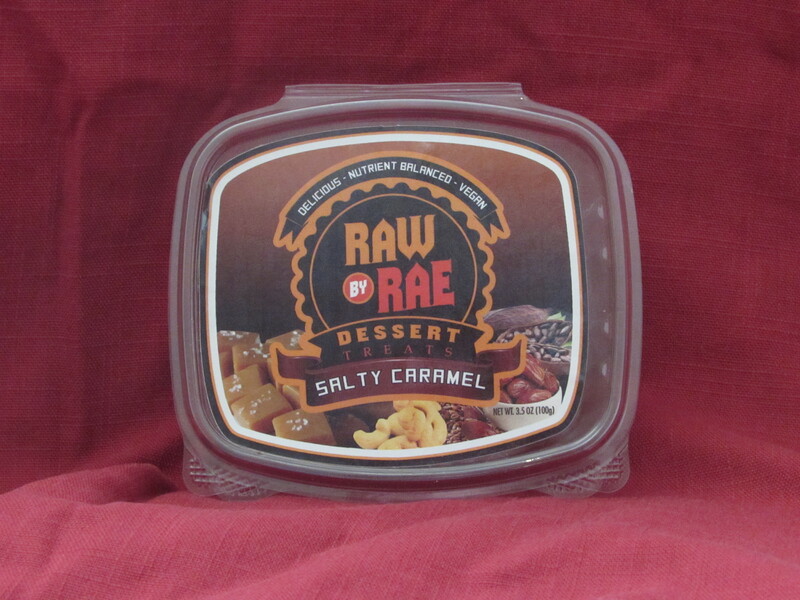 They main ingredient in the Raw by Rae desserts are dates – not sugar. I gave a few tastes to my little family, as well as my brother-in-law and mom. The overall consensus I got was: they are different, but good. Josh said he wasn’t a fan, but that they are definitely something people should try.My kids loved them! PJ would open up the fridge and see the samples still in there and ask for a “Rachel snack,” as I called them. He was disappointed when he discovered they were all gone! AJ is also sad that they have vanished. Everyone had their opinions of which one they liked the best, and that’s ok. There are over 14 different flavors of these desserts. Some that seem interesting to me are Mint Chocolate Chip and Chocoholic! I don’t have any dietary restrictions, but these are friendly to many different types of eating! They are gluten-free, soy free, dairy free, and grain free. They are also vegan. So, almost anyone can try and enjoy them. I would recommend giving these a try.